Welcome to Tr3 Trends , NCTQ's monthly newsletter designed just for school district officials. Each month, we use data from NCTQ's Tr3 database to highlight the latest trends in school district policies and collective bargaining agreements nationwide. Tr3 contains teacher policies from 114 school districts, including the 50 largest districts, the largest district in each state, Broad Prize winners, Gates investment districts and members of the Council of the Great City Schools. In this issue, we look at how many sick and personal days teachers get each year and what districts are doing to stem teacher absences. On average, Tr3 districts give teachers about 13.5 leave days a year for illness and personal reasons. The districts that give the most general leave--which includes sick and personal days plus leave for things like religious holidays and family illness--include Hartford (25 days), Toledo (24 days), and Burlington, VT (24 days). At the opposite end of the spectrum are Dallas, with 8 days of general leave, and Austin and Desoto County, MS, which each give 9 days a year. 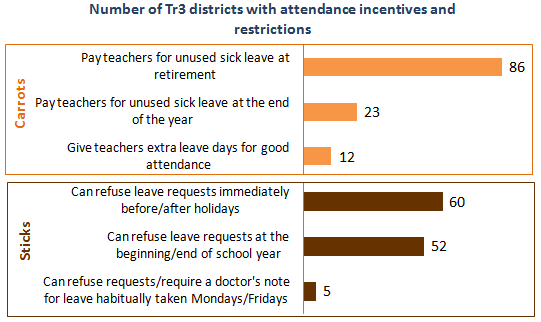 To see how much general leave is given in all Tr3 districts, check out our brief A Closer Look at Teacher Leave Benefits. 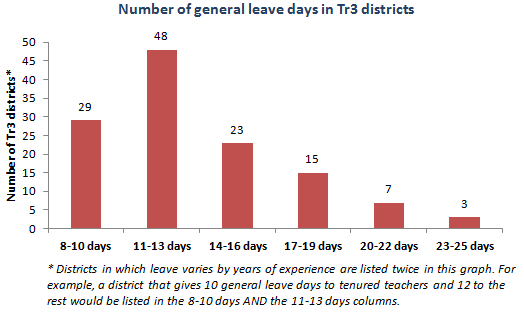 In the eight districts that NCTQ has studied in-depth, there is no correlation between the number of general leave days teachers get and the actual number of leave days teachers take. In Los Angeles--the district that gives the least amount of general leave in the eight-district sample--the average teacher used up almost all of the 10 days allotted. However, in four districts that offer more general leave than Los Angeles, teachers took fewer than 10 days: Miami-Dade; Kansas City, MO; Springfield, MA; and Boston. Boston is especially notable since it offers the second-highest amount of leave (21 days), yet teachers took the least amount of leave (6 days) in the sample. Tenured teachers in Baltimore took the most leave--13 days--but Baltimore is in the middle of the pack when it comes to the amount of general leave it grants each year. 75% of Tr3 districts (86 out of 114) pay teachers for unused sick leave at retirement. 52% (60 out of 114) can refuse requests for leave immediately before or after a holiday. Who gives the biggest "carrots" to discourage the use of leave? Houston pays teachers 100% of their daily rate for each unused day at retirement and Florida districts like Broward, Orange, Palm Beach and Pinellas pay up to 100% of the daily rate at retirement, depending on years of service. Chicago used to pay teachers 85%-100% of their daily rate for unused sick days, but under its new contract teachers can't cash out on them. Starting in the 2012-13 school year, Chicago teachers can only convert unused sick leave to pension service credits--and there's a 40-day cap on that. Twenty-three districts give annual rewards that pay teachers for unused sick leave at the end of each year. These districts include Broward, Brevard and Miami-Dade, in Florida (80% of daily rate for unused days); Providence (100% of daily rate, for up to 5 days); Washington, D.C. (50% of daily rate); and Denver (daily substitute rate). And how about those "sticks"? Five districts have contract or board policy provisions that allow principals to either deny or require a doctor's note when requests for leave are on Mondays and Fridays. Those districts are Cobb County, GA; Albuquerque; Cincinnati; Pittsburgh; and Bridgeport, CT. Anoka-Hennepin's contract says principals can use their judgment when denying leave requests; Tulsa's says principals can request a doctor's note whenever they deem it necessary.